1 x 200ml Weck Tapered Jars - 751 - jar only or choose to include glass lid, rubber seal and 2 stainless steel clamps. Super versatile size jars: can be used as serving dishes, storage jars or for preserving jams, salsas and chutneys. The point of canning is to hermetically seal the outside world from the sterilized interior of the jar, preventing the food inside from spoiling. These jars are designed to make it easy to tell whether or not this all-important seal has been made. Boiling the filled jars (also referred to as ‘processing’) and the cooling period directly afterward, creates a vacuum seal tight enough to keep invisible microbes from entering the jar. The strength of this seal alone is also what keeps the glass lids in place. After the jars have fully cooled, the stainless steel clamps are removed and you can check if the jars have sealed by lifting the lid. If it doesn’t come off, you know for sure the jar is sealed. If the jar didn’t seal properly, you can either re-process it, or refrigerate the jar and eat the contents within a couple of days. Brand new 30ml jam jars in a pack of 20 complete with lids. Perfect for samples or flavoured oils. .. Preserve your food the natural way with the Weck Fermenting Jar. Fermenting food is the oldest form..
290ml Weck Tapered Jar (Short)- Case of 6 with rings, lids and clamps290ml Weck Preserving round..
6 x 370ml Weck Tapered Jar - 741-includes glass lids, seals and clamps370ml Weck Preserving Roun..
6 x 580ml Weck Tapered Jar- 742 - includes glass lids, seals and clamps580ml / 1/2 litre Weck ..
6 x 850ml Weck Tapered Jar - 743 - includes glass lids, seals and clamps850ml / 3/4 litre Weck P..
12 x 165ml Weck Tapered Jar - 976 - includes glass lids, seals and clamps165ml Weck Preserving M.. 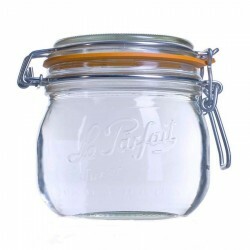 Le Parfait Super jars are perfect for all styles of preserving, including storage of dry goods, as w..
12 x 200ml Weck Tapered Jars - 751 - includes glass lids, seals and clamps. Takes medium size access..
12 x 300ml Weck Tapered Jars - 750 - includes glass lids, seals and clampsSuper versatile size..
140ml Weck Tapered Mini Jar - 761- Case of 12Weck reusable Glass Jars are of the highest quality..
1 x 300ml Weck Tapered Jars - 750 - jar only or jar with glass lid, rubber seal and stainless steel ..
80ml Weck Mini Tapered Jar - 080 - SingleWeck reusable Glass Jars are of the highest quality an..